The fourth quarter of 2016 was not short on news, primarily focused on the dramatics associated with the US Presidential Election. The world reacted to a surprise win by now President Trump over Hillary Clinton, OPEC made positive progress, and the ECB announced plans to continue their quantitative easing for another nine months. Despite a slowdown compared to strong GDP growth in Q3, the US grew GDP at an estimated annual rate of 1.9% for Q4. For reference, GDP in the third quarter increased 3.5%. The final quarter of 2016 was lifted by increased consumer spending, business investment, increased spending by local and state governments as well as a bounce back in home construction. On the flipside, exports decreased at the same time as imports increased and federal government spending slowed. The sluggish growth remains in line with the average annual GDP of 2.1% since the recession, which ended in mid-2009. President Trump stated during his campaign that he could grow American GDP more than 4% via tax cuts, deregulation and job creation through infrastructure spending. The implementation of President Trump’s suggested policy changes and eventual outcomes remains to be seen during the coming years. The labor markets continued growing via the addition of 161,000 jobs in October, 178,000 in November and 156,000 in December. The unemployment rate remains healthy at 4.7%. Furthermore, the labor force participation rate remained unchanged throughout the year at 62.7%. After much anticipation, the Fed showed increased optimism about the US economy by increasing interest rates for the first time in 2016. The Central Bank took their last meeting on December 8th to bump the federal funds target rate by 25 basis points from 0.50% to 0.75%. Furthermore, the Central Bank alluded to increasing rates another 3 times during 2017. This announcement led to many U.S. lenders raising their prime rates in response. International markets witnessed several key developments in Q4. In early December, the ECB announced plans to continue quantitative easing through the end of 2017. The stimulus will remain in place beyond 2017 however, the bank will decrease purchases to €60B per month as of April 1st from the current €80 per month. During his news conference, Mr. Draghi emphasized that this move should not be seen as tapering and the ECB continues with their commitment to easing. In regards to Brexit, in Prime Minister Theresa May’s first conference with the Tory Party, she announced the plan to trigger Article 50 by March 2017. In mid-January of 2017, Prime Minister May declared “No deal for Britain is better than a bad deal for Britain,” as she emphasized her plan for a hard Brexit which would mean Britain will leave the EU single market. China’s government also made news during the quarter signaling a plan to loosen the Chinese yuan’s peg to the USD. Rather than the yuan being solely pegged to the USD, the intention is for it to be pegged to a basket of currencies, thereby decreasing the currency’s dependency and volatility tied to USD fluctuations. 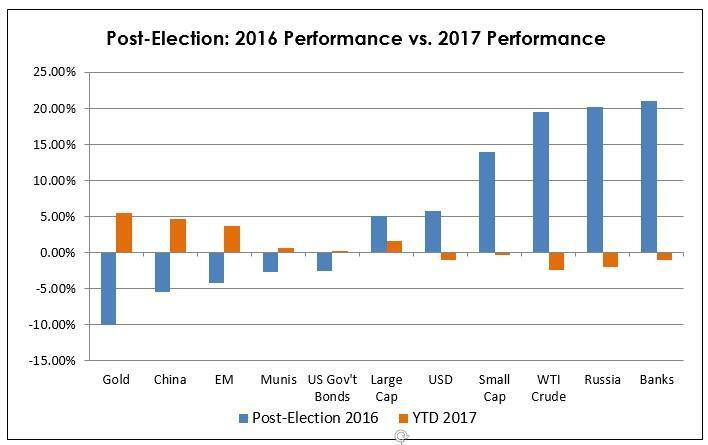 Domestic equity markets performed particularly well during the fourth quarter (S&P 500 +3.82%) as market participants reacted favorably to the Trump election. The previously noted President Trump proposal for higher growth driven by a lower tax rate and deregulation caused investors to flock to domestic equities. Most sectors performed positively, however, there is still significant uncertainty looming within the healthcare sector (down 4.00% for the quarter) given the unclear future of the Affordable Care Act. The Trump victory served as a huge tailwind for financials, +21.10%, and industrials, +7.21%, due to the aforementioned regulatory changes in addition to Trump’s plan to increase jobs by improving infrastructure. After nearly two years of poor performance, energy came roaring back in 2016 increasing +7.28% in Q4 and served as the best performer for 2016 YTD up +27.36%. Oil prices increased as market dynamics moved towards a balance between supply and demand and positive steps from OPEC resulted in an optimistic outlook. After leading global equity markets through Q3, Emerging Markets took it on the chin, declining -4.08% during the final quarter as a Trump victory caused significant uncertainty in regards to trade and immigration and also led to a rising USD. As noted in the below chart, there were clear winners and losers from the US Presidential election that rippled across the world. YTD in 2017 however, many of those largely negative performers in Q4 bounced back. Bottom Line: Domestic equities are expected to perform well, especially within financials, energy, and industrials, however, volatility should persist. This volatility will allow for appropriate rebalancing to maintain exposures. We continue to favor domestic over international equities. On the contrary to domestic equity markets, in the fourth quarter bond markets experienced one of the largest sell-offs since the financial crisis as seen from the results of the Barclays Global Agg Index -7.07%. Yields were already inching higher but the move only accelerated as a result of Trump’s victory. His campaign rhetoric suggested higher interest rates and expansionary fiscal policy. Longer duration, municipal and emerging market-denominated fixed income suffered the most. Returns across the yield curve showed no clear pattern in 2016. Going into the end of the year, the curve steepened and continued to shift upward. The spread widening has impacted the probability of recession which has declined from 9.24% down to 4.07%. Consequently, the curve is optimistic about a continued economic recovery although many experts are cautious as they anticipate rate volatility. The Federal Reserve met in December and hiked rates for the first time in 2016 increasing the key interest rate of 0.25% to a range of 0.50% to 0.75%. The combination of President Trump’s win and a better employment situation suggest faster rate hikes than initially anticipated, with the potential for three in 2017. Additionally, the London Interbank Offered Rate, commonly known as LIBOR, is the rate at which banks lend to one another. The borrowing costs that we as consumers pay are closely tied to this rate. As illustrated in the chart of 30-day LIBOR below, this rate has surged throughout the year. 60- and 90-Day LIBOR charts highlight a similar phenomenon. The upward trend is a result of the regulatory changes with regards to money market funds. Bottom Line: Massey Quick had positioned portfolios to be exposed to high quality and short duration fixed income which benefited us in Q4. We expected continued rate volatility and continue to look for alternative sources of income. Hedge funds generally posted positive returns in Q4 despite November causing significant volatility and difficulty. For funds that incorporate a macro-related or top-down approach to their portfolio, the anticipation of a Trump win would have translated into a significant sell-off, however, as we saw in Q2 with the surprise Brexit vote, the Trump win caused only very short-term overnight volatility in international markets and sent the rest of the equity markets soaring. Hedge funds with any hedge in place suffered with this dramatic trend upward. There were clear winners, including HFN Distressed +4.03%, HFN Macro +2.00% and HFN Equity Hedge +1.78% and losers HFH FoF +0.63% and HFN CTA/Managed Futures -0.90%. Bottom Line: Despite challenges, Massey Quick remains confident and continues due diligence on liquid alternatives that offer uncorrelated sources of return. We believe the increasing levels of volatility and market inefficiencies in illiquid assets create attractive opportunities. Massey Quick continues to look for smaller, nimble and niche illiquid managers that will benefit in such an environment.